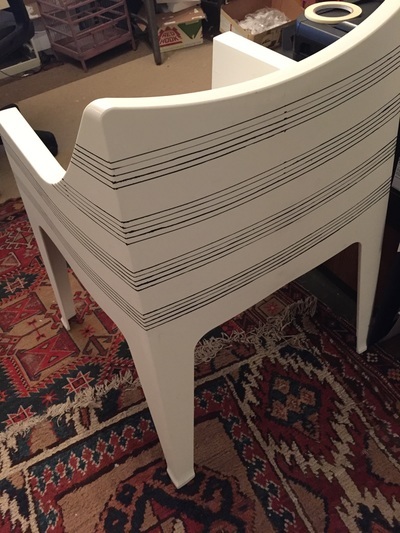 A landmark new creation by Livingston Sound, putting the listener in direct contact with the music, which radiates through the surface of the chair for the ultimate in sonic tactility. 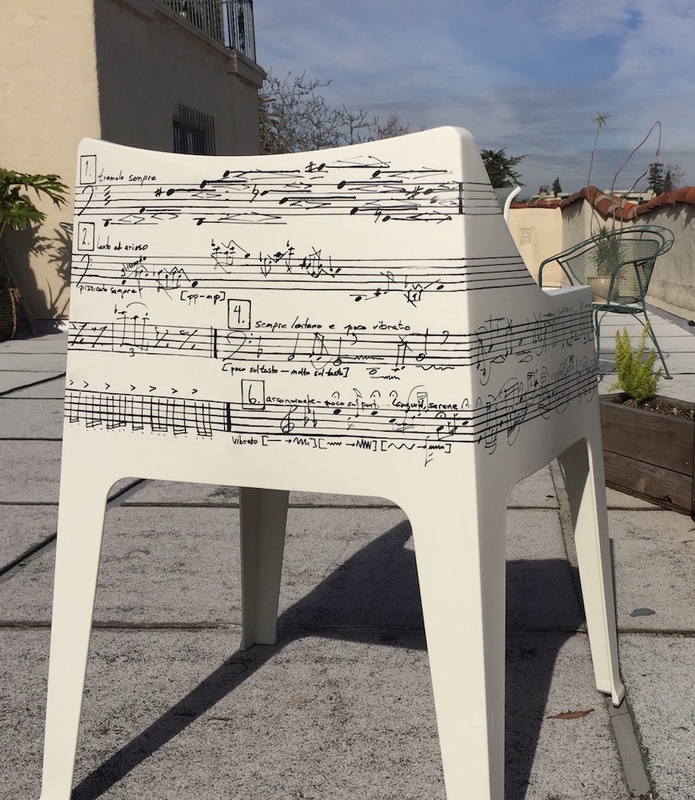 In April 2016, we will release a limited edition of 12 chairs with original music, drawn in the composer's hand on the surface of the chair. Prototypes are shown here. Plus, a new version of the chairs for the Gardens at Dumbarton Oaks, opened Spring 2016! Sonoma County: Sonoma, CA, Potter Green at Cornerstone Gardens, 10-5 daily. Napa County: Rutherford, CA, at St. Supery Winery, 10-5pm daily through April 30. EXTENDED TO JUNE 15! Curated by Topher Delaney in conjunction with Arts in April Napa Valley. Contra Costa County: Walnut Creek, CA at the Ruth Bancroft Garden, Jun 17-Jul 17. Peninsula: Burlingame, CA at Kohl Mansion, in association with Music at Kohl Mansion, beginning October 2016. Composition for Dumbarton Oaks Gardens (National Geographic's Sixth Greatest Garden in the World) by Hugh Livingston. The gardens, in the Georgetown section of Washington, DC, are open to the public 2-6pm, except Mondays. West Coast version, at the new sonogarden Healdsburg, opened May 2015 in Sonoma County. 10am-dusk daily at the Duchamp Hotel, just behind Shed. Free parking while visiting the garden. The string quartet presents the visitor with two unusual experiences. First, the feeling of the string instrument’s fundamental resonances, radiating through the chair into the body. Second, the true nature of the counterpoint between the intertwined individual voices of a string quartet. 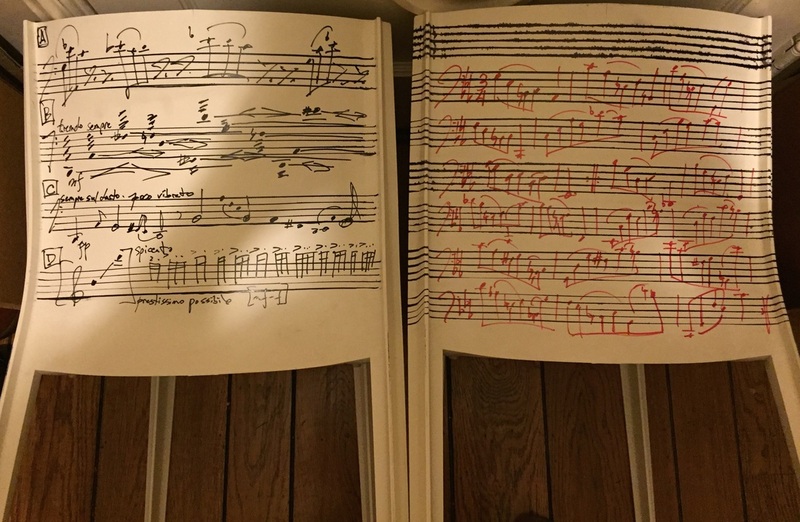 By placing the experience at the center of that interchange, rather than at the distance typical of a concert hall, a new insight is offered into the essence of chamber composition. The voices of the string quartet are in fact all cello, recorded by the composer. There are canons and inversions and call-and-response, mimicking the easy intimacy of the social nature of a quartet, and inviting the listener to share in that experience. 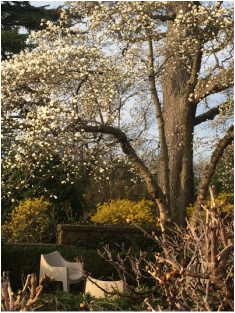 Garden designer Beatrix Farrand wrote that with the sound of falling water and the wood thrush, peace comes ‘dropping slow’ to the garden at Dumbarton Oaks. She was referencing The Lake Isle of Innisfree, in which William Butler Yeats writes "And I shall have some peace there, for peace comes dropping slow, Dropping from the veils of the morning to where the cricket sings.” While the energy of the composition changes from moment to moment, many of the 23 sections reference either the sound of the wood thrush, or the feeling of peace descending on the garden. These custom-made sonic chairs by Livingston Sound have transducers that radiate sound through the sitter's spine, making for the ultimate in immersive experiences. The idea was first developed as an attempt to connect an audience with the tactile essence of playing the cello, conveying the immediacy of the vibrations felt by the performer. Two elements are always combined in the installation known as Please Be Seated: cello performances by Hugh Livingston and sounds of flowing water. Each chair in the group is different, encouraging audience engagement with different experiences, ranging from long sustained ringing notes to rapidfire pizzicato. Below, watch an annotated video of the first installation, at the Kaiser Rooftop Garden. Over 3,500 people have enjoyed the cello chairs. Order a set today! The installation Please Be Seated has been exhibited in Washington DC, Oakland, Berkeley, Los Angeles, San Diego, Healdsburg, Prague, Slavonice (CZ) and Schlägl (AUS). It can be combined with live performance, and be made interactive based on actions of the audience. 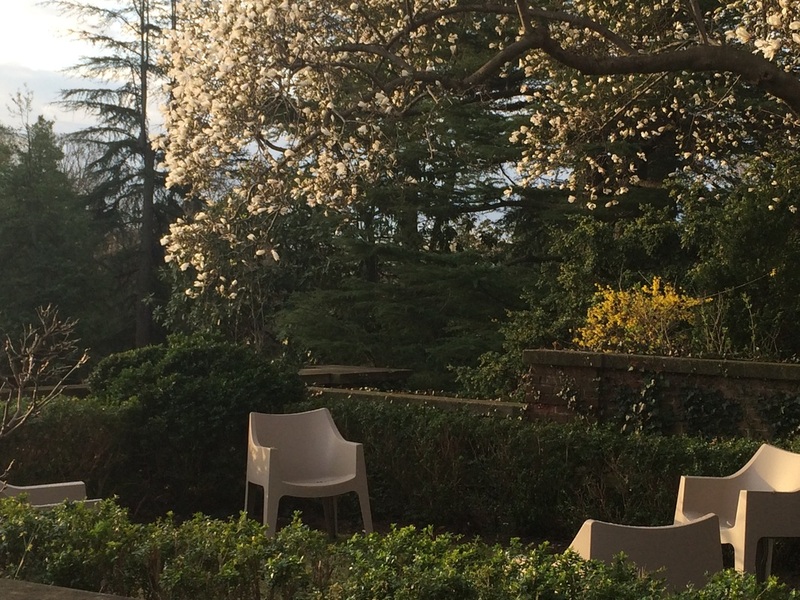 The most common form of the installation is 4 chairs arrayed some distance from each other in an outdoor setting. A table can also be used, with sound emerging from it as well. Each sound source provides a separate musical line, so that the experience varies with position, yet the lines join together in a unified musical experience. Sounds of any river can be requested. We are excited to have transferred the audio chair technology to a new chair, the Coccolona from S.C.A.B. Design in Italy. These are more readily available, and in different colors, as well as in a loveseat. Ideal for outdoors and poolside, we can give you an exciting - or relaxing - playlist of original music designed to be experienced through the surface of the chair. 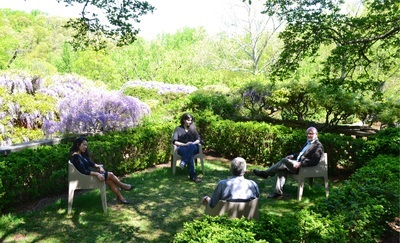 These are available for experiencing at the Dumbarton Oaks Garden in Washington DC (opened March 2015 and continuing indefinitely) and in the showcase ﻿sonogarden﻿ in Healdsburg, CA (opened May 2015). Installed in the front courtyard of the Conrad Prebys Music Center at the University of California, San Diego on the occasion of the 50th Anniversary Celebration of the Music Department, Sonic Diasporas, January 2011. Please Be Seated: Benches, UC San Diego Conrad Prebys Music Center from Livingston Sound. Nice little feature video newly made by the Dumbarton Oaks staff describing the art in the gardens program. Prefer to lounge by the pool and have a full-body immersive, chakra-aligning experience? 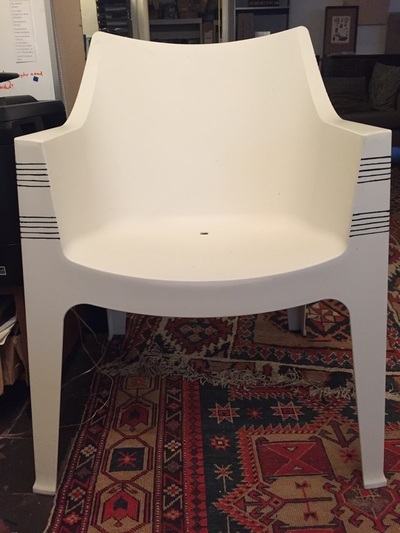 We can retrofit any chair or chaise.